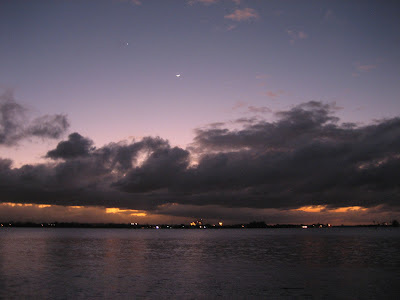 Tuesday, Dec. 26th, 2011: Puerto Rico. Rainforest drive. Porto Rico must be a long way from the Bahamas – and the cruise ship, I suppose, can only go at about 20 knots, or a little over 20 miles per hour – because we arrived at Puerto Rico a little past noon the day after Christmas, 46 hours after we left Nassau. 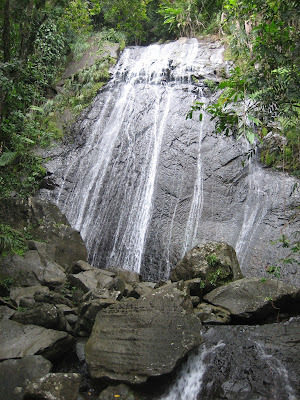 Porto Rico itself – from what we saw on a guided 45-minute drive to the El Yunque rainforest – looked rather poor and congested. 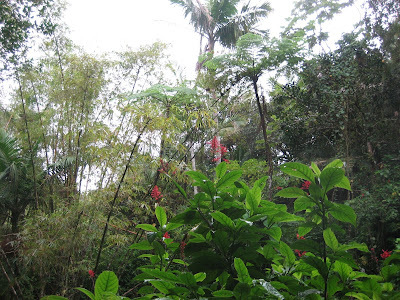 But when we got to the rainforest, it was a true haven of nature. 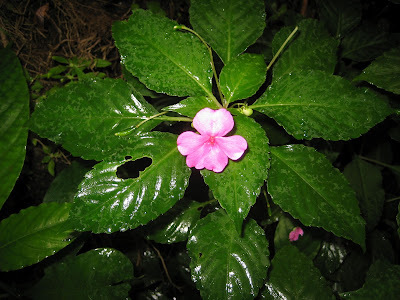 Frogs chirped in the trees, orchid-esque flowers hung from canopies, and impatiens (which in Spanish are known as the “look at me pretty” flower) flourished everywhere. Water – a great abundance of it – flowed in creeks, down waterfalls, and occasionally from the sky. The air felt moist and fresh. I would happily have spent our entire time on the island just escaping into this wilderness. After a few hours at the park, our tour – partially because the park closes early in the evening, and partially because this was a “rainforest drive”, not a “rainforest hike” – turned back. With still a couple hours left in San Juan (the bus got us back at 5:30, around sunset), Katrina and I embarked on an ambitious encirclement of the “Old Town”, tracing the ruins of a 16th-century citadel. At each bend, we kept hoping that we’ll be treated to a good view of the sunset – or to the post-sunset, or to the post-post-sunset. But the wall of the citadel kept stretching relentlessly onwards. Even once we came upon a hill – where, be it on that particular day or on any occasion, hundreds of kids were flying kites – the good view was still blocked by a “don’t-proceed-beyond-this-point” fence. It was way past sunset that we finally made our way down to the ocean, to enjoy the last ambers of color fading into the night. 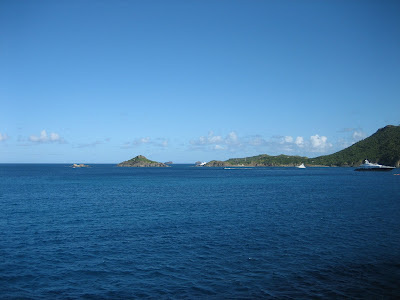 Wednesday, Dec. 27th, 2011: French island, Saint Barthélemy. On our own. 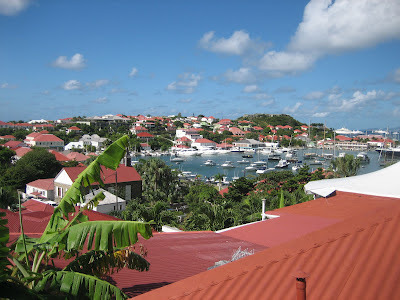 When we woke up the following morning, our cruise ship had just anchored off the coast of Saint Barthelemy, the island of the rich and famous. 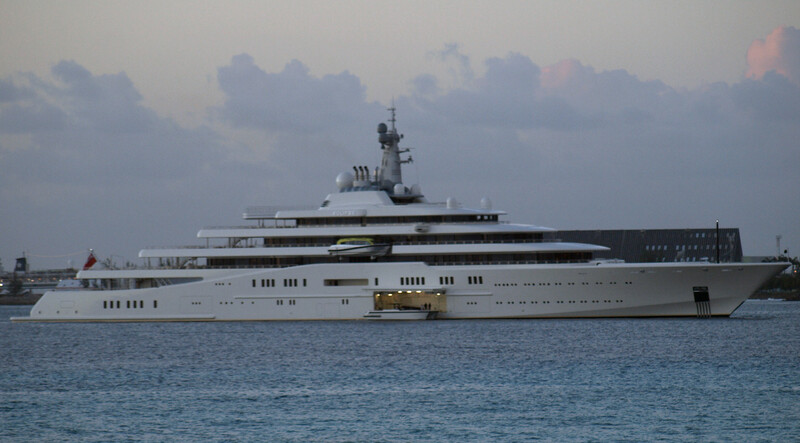 You may think I jest, but we were anchored right across from the largest privately-owned yacht in the world, owned, coincidentally, by a Russian, Roman Abramovich. Aside from its slick design, which we witnessed firsthand, the internet reveals that the Eclipse (good name!) features a missile-detection system, two helipads, and a miniature submarine. The other vessels around us, while smaller, looked every bit as chic. With the cruise ship anchored half a mile from land (for all the yachts, it’s a rather small island, originally meant for vessels of smaller scale), the crew had to operate a tender boat to ferry passengers back and forth. Once we were on shore, lacking the riches and fame of our fellow travelers and native inhabitants, we walked half-way across the island to the famed Columbier bay, rather than taking a taxi. We had expected the walk to be through pleasant French-esque countryside, and the beach to be a remote place of natural wonder. What we forgot is that the island was meant for yachts, not pedestrians – the road leading to Columbier was just a road (no sidewalks, quaint houses, etc), and the remote beach, while remote for walking, was perfectly accessible from the ocean. Dozens of yachts were anchored along the bay, each operating its own tender service on tiny inflatable boats. 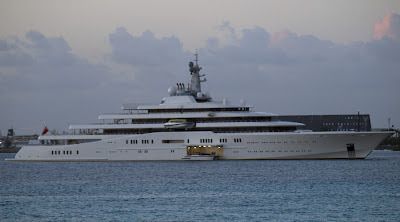 I wondered, vaguely, if the yachts we saw here were themselves tenders of even larger Abramovich-like yachts, in the fashion of stackable Russian dolls. And also, what would Steve Jobs’ yacht have looked like, if he’d had the chance to finish it. As it turned out, only one of Columbier’s bays was crowded with boats: the other, facing the wind and lacking a beach, held little allure for the yachts. However, it also offered little hope for snorkeling: the water was too turbulent, and we’d risk being smashed into the rocky shore. So, following the advice of a yacht-owning Englishman (we met him on a hill between the two bays, where he and his family were out for a walk; when he found out how far we’d come from, he had only word: “intrepid”), we chose the yacht-favored bay for snorkeling. It was a good choice, and our first encounter with Caribbean fish, who were colorful but not quite as plentiful as in Hawaii. Particularly memorable were His Honor the Neon-Blue fish, His Honor the Foot-Long Skinny-Alligator-Like Fish, His Honor many many others (“Fiddler on the Roof” reference, for those who think I’ve just lost my marbles). There were also some corals. After an hour, we got out and followed a 20-minute trail around the picturesque second bay. There we came upon a tiny beach, much more open to the ocean than where we’d just snorkeled, so we used the opportunity to get a good swim, instead. It was great fun, riding on the shoulders of waves that would lift us a good 5ft into the air; there were also impressive mushroom-looking corals below us, and some corals that intuitively resembled elephant brains (not that I’d ever seen one). We swam a few hundred yards out into the ocean so we could see around a protruding cape, and then, pressed for time, turned back. Having “intrepidly” walked half-way across the island to get to Columbier, we did not fancy re-tracing our steps all the way back. The problem was, we had no idea how to call a taxi, or even where we’d find a payphone. Katrina saved the day with her French fluency; she approached a receptionist at a nearby restaurant, and – since neither the receptionist nor her coworkers knew how to call a cab – the girl volunteered to take us to the dock herself, refusing payment (and they say the French are rude heartless people!) And so, in this most expensive of the Caribbean islands, we got to visit some of the most remote spots on the island, and spent a grand total of 2 Euros while ashore – on one postcard and two stamps.